Options (“Basic” tab) – Radio options are entered here, each option on its own row. 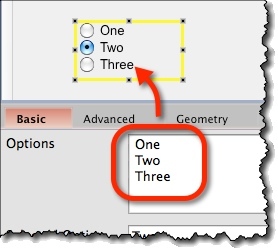 Selected Option (“Basic” tab) – Which of the above options will be displayed as selected. 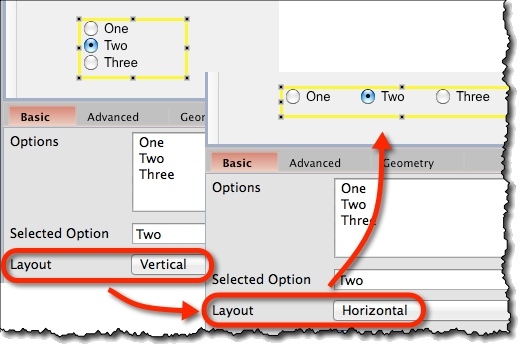 Layout (“Basic” tab) – Whether radio buttons will be displayed in vertical column or horizontally in a single row. 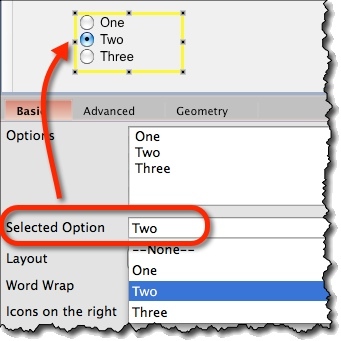 Word Wrap (“Basic” tab) – Switch word-wrap for all radio options on or off. Icons on the right (“Basic” tab) – Specify here whether icons and labels will be displayed icons-left (default) or icons-right.